rystal clear Antler Lake is springfed with an abundance of largemouth bass, northern pike, walleye, crappies and sunfish. Our unspoiled shoreline is home to many waterfowl, including the spectacular loon and heron, the evasive deer and bear, and occasional summer visitors. There are no other resorts. Antler Lake, just south of the continental divide, is the source of the Prairie River and is connected to Beaver Lake, only accessible by a small navigable channel. Antler Resort provides wilderness beauty and recreation on 40 spacious acres surrounded by the George Washington State Forest. We are easily accessible off scenic Hwy 7, just south of the Scenic State Park. 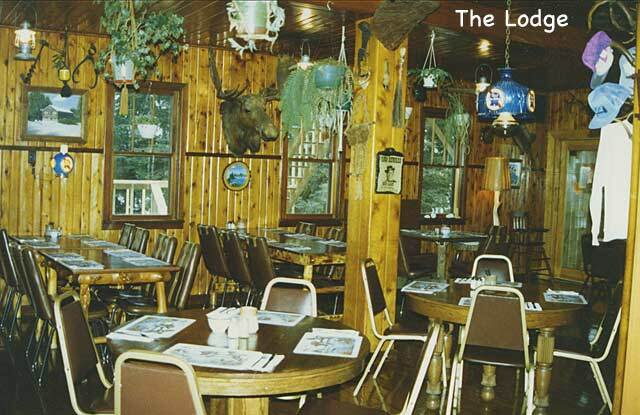 Enjoy our cozy lodge with lottery, wildlife mounts, artifacts & collectors items. Rustic Lodge featuring "Ye Olde Antler Eatery & Saloon"
Snowmobilers may ride in or leave from Antler Lodge on groomed trails connecting with over 200 miles of groomed wilderness trails including the popular Taconite Trail. Snowmobile right from your front door! Detailed maps are available. Fishing is great. For the avid hunter there are grouse, deer and bear. Or just come for the spectacular fall colors. Fall season is a beautiful time to go hiking in the woods or enjoying natures beauty on the lakes. Swim or relax on our gently sloping sugar sand beach or swim raft. The sauna, docks and fish cleaning facility are located conveniently nearby. You can go fishing, hiking, sightseeing, boating, play horseshoes, baseball and volleyball. We have activities for the whole family. We have an abundance of wildlife, and are only minutes away from the beautiful Scenic State Park. See the Ladyslippers in bloom. Enjoy the beauty of the North Woods awakening from the winter. Our modern housekeeping cabins, nestled among the pine and birch are well spaced along 3,000 ft of prime lakeshore. All have knotty pine interiors and carpeted floors. They are comfortably furnished with fully equipped kitchens and bathrooms with showers. Most have screen porches or decks. Five are winterized for year round use. All are gas heated. We provide all esssentials for housekeeping except soap and towels. 2 dining rooms filled with artifacts and mounts.. Full menu includes: Prime Rib, Lobster, Crab Legs, Shrimp, Steaks, Chicken, Burgers and Pizza. Shop for antiques and crafts. Extra persons - $25 per week, maximum 2. Day guests by prior arrangement. All guests must register on arrival. Fishing boats - $25 per week. Cabin deposit - $100 per week required. Check-in time - 2:00 pm Saturday. Check-out time - 9:00 am Saturday. (Please bring your own towels). NO PETS except by prior permission $25 per week. *Please bring your own life jackets, they are required by State Law. to check out the latest trail conditions! Copyright © Antler Lodge and Resort.